Rarely is a book so well suited to its launch venue as Jane Urquhart’s A Number of Things: Stories of Canada Told Through Fifty Objects was to the event space at Library and Archives Canada. After a decade of closed doors, being permitted into the second floor room felt like being allowed back into history, a perfect segue to Urquhart’s first book of non-fiction. On its face, the project behind A Number of Things was both immense and contained: In honour of Canada’s sesquicentennial, Urquhart would tell a story of this country through 50 objects of her choosing. “Our story is here, in at least some of its forms,” Urquhart said, by way of explaining that her book is not the history of the country, but rather one look at our collective story. Flanked by large TV screens showing slides, Urquhart’s presentation was the kind of generous, open look at a writer’s life and process that attendees at book launches dream of. Opening with a black and white photo of her young, pre-child parents sitting on the steps of a farmhouse, Urquhart told the story of how they travelled to northern Ontario — where she and her siblings would be born and raised — and of the dreams and objects they took with them. A small, intricately painted and delicate sugar pot — already passed down through multiple generations before being carefully packed up and brought north; a pair of moccasins Urquhart was given as an infant from the chief of the Anishnawbe across the lake; a small Inuit carving of geese her father brought her from a trip farther north — Urquhart’s personal objects both inform and are completely separate from the ones she chose to include the book. The refrain “This isn’t in the book” became a kind of running joke as Urquhart presentation veered increasingly into the personal, feeling at times like a glimpse at a family slideshow. “I think this is the last one,” Urquhart said about numerous slides, each time finding that, no, there was another — Urquhart as a young girl, afraid of horses (“A horse is one of the objects in the book,” she said), a Japanese sword guard, given to her at the launch for her 2001 novel The Stone Carvers , and many photos of her cottage in Ireland. Of course, some of the photos lined up with the book. Many of the objects she wrote about have no connection to her, but Urquhart said she did find herself and her “pioneer” upbringing creeping into the essays. One of the objects, Tent, was very particular for Urquhart. Although she left many of the objects mysterious or merely hinted at them — “You’ll have to buy the book,” she winked — she read the short essay she wrote for Tent in full. It is a story that starts with Irish immigrants working to build Maple Leaf Gardens. Among that crew is a man named Danny Henry who, after making his way to the mining towns in northern Ontario, would become her father’s best friend and her godfather. The titular Tent, Urquhart says, is really Henry’s prospector’s tent, the only real home he owned for nearly 40 years. But, tents have a much longer history in Canada, and Urquhart’s essay folds in a beautiful passage about the “skin tent” used by First Nations, detailing its construction, utility and portability. That push-pull between the objects of immigrants and those of Canada’s First Nations is a ribbon throughout the book, and a theme to which Urquhart returned throughout her talk, as well as during the discussion with CBC’s Sandra Abma. It didn’t matter what object she was focusing on, Urquhart said, all the research came back to Canada’s Indigenous people and what has happened to them. In part, Urquhart told Abma, that is why the book opens with the Beothuk legging. For Urquhart it is the most resonant object in the book, but more than that, she wanted it front and centre, where it could not be ignored. Throughout the evening, Urquhart was warm, open and generous in both her presentation and, later, the way she answered audience questions. Surely one of Canada’s most celebrated authors, Urquhart is a respected poet, novelist and, with A Number of Things, has now taken the plunge into non-fiction. That breadth of experience makes Urquhart a perfect author to headline a night that was also a celebration of the 80th anniversary of the Governor General’s Literary Awards — an award Urquhart won in 1997 for her novel The Underpainter . Books, of course, are objects too, and if “material culture” tells us what we value (as Urquhart asserted), then what better book to usher us toward both a celebration of our country’s 150th birthday and our longest running appreciation of the literature created here. Charlotte Gray once got into trouble for referring to Library and Archives Canada as “a morgue,” but on October 17th, the scene at the LAC was most definitely alive. After being introduced by Festival director Sean Wilson and LAC director Guy Berthiaume, Gray asserted that the past is where Canadians must look if they are to find a coherent present. It is precisely in the archives, she argued, where we will find both our current identity and our future together. Gray’s newest book, The Promise of Canada: 150 Years – People and Ideas That Have Shaped Our Country is a deliberately open-ended story of a nation whose story is still evolving. Structured as a series of nine short biographies, The Promise of Canada portrays the country as the product of its citizenry. The choice of which individuals to include is obviously subjective, and Gray acknowledges that the presence of neither prime ministers nor hockey players will undoubtedly be a shock to some readers. Instead, the better- and lesser-known figures included in Gray’s book portray a country where stereotypes fall apart on closer inspection, where the act of inclusion – whether in publishing, legislation or storytelling is an act of nation-building. Gray presents The Promise of Canada is an immigrant’s sesquicentennial gift to her new home country. That gift is not just the story of the nine figures profiled in The Promise of Canada, but the start of a new conversation about what it means to tell the story of a nation. Gray began her presentation with some of the highlights from her research: phenomenal images by painter Emily Carr; political intrigue and scandal-worthy gossip about George-Etienne Cartier and the moving life story of Elijah Harper, who rose to prominence as an Aboriginal leader in the Manitoba legislature in the 1990s. Gray tied each individual’s story neatly to her main themes of Canadian national identity: a commitment to federalism; an evolving dialogue of inclusion and multi-culturalism; the on-going human relationship with Canada’s vast and unforgiving natural landscape. The themes of immigration and outsider status also work their way through the Gray’s project, as does the recognition of a certain national tendency towards pragmatism and away from heroics. (Why, Gray asked, do so many Canadian narratives feature the lone survivor as a protagonist, as if public attention was merited only by the accident of survival from disaster?) Humorously conceding that her book is a reflection of her own interests and experiences, Gray invites readers to make their own lists of influential people and ideas. The Promise of Canada is a lively remedy for what Gray sees as a public tendency to disengage with Canadian history. For the second half of the evening, the OIWF invited Supreme Court Justice Rosalie Abella to converse with Gray about her writing process. Abella, whose own impressive biography would probably merit inclusion in a sequel volume, led Gray and the audience through a series of thoughtful questions which could hardly be answered in a single night. This reviewer is still thinking of new answers for Abella’s questions, which included: “What holds Canada together?” and “Who helped embed Canadian qualities, whatever they might be, in the national psyche?” Gray responded with a distinct awareness of her role as a biographer, as well as great clarity about her own perspective as a British immigrant to Canada. Gray, who arrived in Canada during a “wobbly moment” of national identity in the late 1970s, has had time to think deeply about the role of individuals in creating a nation. Yet the story of Canada, like that of any other vibrant nation, is never complete. Each generation, Gray and Abella agreed, write their own story of their homeland, be it native or adopted. On October 22nd we are featuring two Irish writers at our festival for two fresh looks at the culture and history of Ireland. 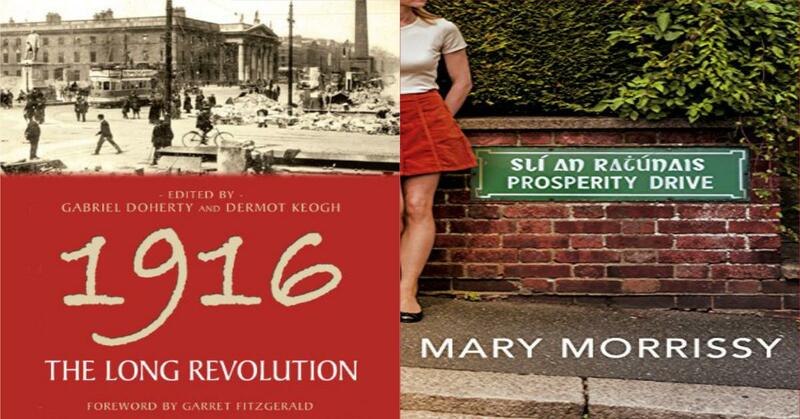 The insurrection of Easter Week, 1916 led to the creation of the Irish Republic and continues to have a profound impact on Irish politics and the Brexit fallout. As we commemorate the 100th anniversary of this seminal event Dr. Dermot Keogh, Emeritus Professor of History, University College Cork, will put the political and international aspects of The Rising into context and engage us in a lively conversation that will weave together the many threads that underpin contemporary Ireland. Click for tickets and details. Mary Morrissy is the winner of the Hennessy Award and a Lannan Literary Foundation Award and has published three previous novels: Mother of Pearl, The Pretenderand The Rising of Bella Casey -- and a collection of short stories, A Lazy Eye (1993). Her most recent novel, Prosperity Drive , has been praised by both The Guardian for its "compassion, immediacy, humour and delicacy" and The Irish Times, "clear-eyed vision and her deep compassion, along with her lovely sense of the comic and her exceptional literary articulacy, make this an outstanding collection." All the characters in Prosperity Drive begin their journeys on a single suburban Dublin street, and everything eventually returns to it. It is an Ireland in miniature. The novel is laid out in stories, linked by characters who appear and disappear, bump into each other in chance encounters, and join up again through love, marriage or memory. She currently teaches at University College Cork. Morrissy will be joined on stage by Man Booker Prize nominee David Szalay and debut novelist Jowita Bydlowska. Click here for tickets and details. Identity shapes how we see the world and how others interact with us. 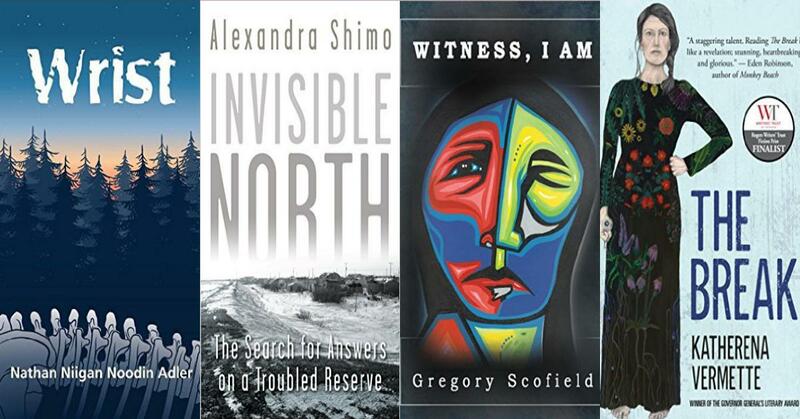 Through fiction, poetry and journalism, these writers illuminate the realisties of racism, isolation, identity and history for Indigenous people across Canada. Writing offers a new window onto the world and through their books stories these Indigeous writers are shifting the conversation about Idigenous rights in Canada. Nathan Adler is a member of Lac Des Mille Lacs First Nation. His debut novel Wrist is an indigenous monster story that will draw you into the lives and stories of the Ojibway people. In 1872, a group of dinosaur hunters in northern Ontario were driven made by a bizarre and frightening illness. Over a hundred years later, the same illness threatens Church and his family. He must delve into his family’s dark history to protect the secrets of his people. He will be part of our Paranormal Prose panel with Kelley Armstrong and Kristi Charish. Click here for tickets and information. Two-spirited Indigenous poet Gwen Benaway’s new collection of poetry, Passage, explores the the effects of violence and the burden of survival for indigenous people. The poems in her collection take readers from Northern Ontario to the Great Lakes, looking at family issues, a legacy of colonization and a new sexuality and gender. She will be joined by Vivek Shraya and Ivan Coyote. Click here for tickets and information. When Stella, a young Métis mother, looks out her window one evening and spots someone in trouble on the Break—a barren field on an isolated strip of land outside her house—she calls the police to alert them to a possible crime. The Break, nominated for the 2016 Writers Trust Award for Fiction and the Governor General's Award, by Katherena Vermette, presents a series of shifting narratives, people who are connected, both directly and indirectly, with the victim—police, family, and friends—tell their personal stories leading up to that fateful night. Through their various perspectives a larger, more comprehensive story about lives of the residents in Winnipeg’s North End is exposed. Vermette will be joined by Zoe Whittall and David Bergen. Click here for tickets and information. When freelance journalist Alexandra Shimo arrives in Kashechewan, a fly-in northern Ontario reserve, to investigate rumours of a fabricated water crisis and document its deplorable living conditions, she finds herself drawn into the troubles of the reserve. Unable to cope with the desperate conditions, she begins to fall apart. Part memoir, part history of the Canadian reserves, Invisible North: The Search for Answers on a Troubled Reserve offers a vivid first-person account of life on a troubled reserve that illuminates a difficult and oft-ignored history. She will be joined by Deborah Campbell and Joy Kogawa. Click here for tickets and information. As we celebrate the 400 years since Shakespeare's death with Margaret Atwood and retelling of The Tempest in Hag-Seed, we are also inviting Keith Barker and Walter Borden to present a Canadian, post-colonial reimagining of some of the key scenes from The Tempest. Click here for tickets and information. Gregory Scofield is of Métis of Cree, European and Jewish descent. In his new work, Witness, I am, he addresses themes of identify and belonging and the issue of missing and murdered indigenous women. He weaves his personal perspective and knowledge of indigenous culture into his work, creating poems that are powerful and moving. Schofield will be part of our Poetry Cabaret with Sandra Ridley, Stuart Ross and Stephen Brockwell. Click here for tickets and information. This fall four writers take us behind the firing line with stories about war and the people it affects. Drawing on personal experiences, as soldiers, journalists and researchers, each writer places the realities of war in perspective with accounts not often told on the outside. In one panel we bring together three novelists who question and explore the theatre of war. In his novel, Into the Sun, Deni Ellis Bechard paints an unsentimental portrait of the impact journalists, mercenaries, messianic idealists, and aid workers have when they flood into war zones. Bechard brings Kabul to life, portraying citizens who are determined, resourceful and as willing as their occupiers to reinvent themselves and survive. Peter Behrens’ Carry Me, is both a love story and a historical epic. The reader gains a fresh perspective on Europe’s violent twentieth century, from the Isle of Wight to London under Zeppelin attack to Germany during the Weimar period. Kevin Patterson’s new novel News From the Red Desert begins in 2001 when everyone thought the conflict in Afghanistan was over. The novel then delves into the mess, confusion and death of a war that was not yet won, and the lives of the men and women involved. Click here for tickets. In the midst of an unfolding international crisis, journalist Deborah Campbell, undercover in Damascus to report on the exodus of Iraqis into Syria following the overthrow of Saddam Hussein, finds herself swept up in the mysterious disappearance of Ahlam, her guide and friend. Haunted by the prospect that their work together has led to her friend’s arrest, Campbell spends the months that follow desperately trying to find her—all the while fearing she could be next. A Disappearance in Damascus: A Story of Friendship and Survival in the Shadow of War is a frank, personal account of a journey through fear, and the triumph of friendship and courage. Campbell will join Alexandra Shimo and Joy Kogawa to talk about the crossover between journalism and memoir. Click here for tickets. Roméo Dallaire, traumatized by witnessing genocide on an imponderable scale in Rwanda, reflects in these pages on the nature of PTSD and the impact of that deep wound on his life since 1994, and on how he motivates himself and others to humanitarian work despite his constant struggle. Dallaire wll talk about his struggles with PTSD and how it has motivated him to help soldiers better deal with the muddy reality of modern conflict zones and to revolutionizing our thinking about the changing nature of conflict itself. Click here for tickets. Standing up and saying something is the first step to making a difference. This fall our festival is showcasing some amazing women writers whose memoirs and fictions shed light on important social issues, such as quality of life on Canadian reserves, war, immigrant experience, sexual assault and gender identity. Be part of the conversation and stand up to make your own change at these fall events. The Personal is Political. What does it mean to visit the site of disaster? What is it life to live it? And what do you do once you are a witness? In their memoirs, journalists Deborah Campbell and Alexandra Shimo share their experiences of working on the front lines of journalism in the Middle East and on Canadian reserves. In Gently from Nagasaki, award-winning author Joy Kogawa traces lines between her family's time spent in Japanese internment in Canada and the events unfolding in Japan at the same time. Do not miss these unbelievable stories of strength, perseverance and the desire to drive change. They join us on October 24th. Fiction Mirrors Fact. Two astounding Canadian novelists explore the darker sides of our family ties on October 24th. Nominated for the Giller Prize, Zoe Whittall's The Best Kind of People takes peers into the darkness that is sexual assualt to understand how it affects the victims and the family of the accused. Set in Winnipeg's West End, Katherena Vermette's Governor Genral's Award nominated book The Break explores the urban indigenous experience from cultural loss to prejudice and family breakdown. Walking the Line. In their new works of poetry, Vivek Shraya and Gwen Beneway explore both the racial, cultural and gender lines they cross in their lives and art. In Passage , two-spirited trans poet, Gwen Benaway's poems travel from Northern Ontario and across the Great Lakes in poetic voyage through divorce, family violence, legacy of colonization, and the affirmation of a new sexuality and gender. Vivek Shraya’s debut collection, even this page is white, is a bold, timely, and personal interrogation of skin–its origins, functions, and limitations. They will perform on October 23rd. Truth in Character. In our Character Studies panel, Jowita Bydlowska and Mary Morrissy crawl into the intimate and personal lives of their characters to show us how they think and what makes them tick. Bydlowska's Guy investigates the elements that contribute to toxic masculinity, while Morrissy's Prosperity Drive takes on an Alice Munro approach to the private lives of the men and women that live in the Irish suburbs. Spotlight on Jane Jacobs. On October 22nd we are putting a spotlight on the woman who radically changed how we see cities and think about infrastructure and design. Two new books take a look at the life of Jane Jacobs, her thoughts and the contributions she made in New York City, Toronto and around the world. Talking to The Guardian about her debut novel Harmless Like You, Rowan Hisayo Buchanan discussed the need to write a variety of characters: “The standard character was a white person,” she says. “I get really excited when I read writers who write people who, let’s be honest, don’t have my exact racial makeup but who are mixed-up in that way.” In her novel Buchanan not only gives voice to Yuki, a half-Japanese woman, but to the fraught relationships between generations of generations: “A lot of what the book is about is how pain shape-shifts down the generations. There is nothing more personal than family, and yet families are so profoundly affected by political decisions,” she told The Guardian. Buchanan is not the only writer at our festival to be exploring the theme of inherited trauma. From Canadian Japanese internment camps, to urban Indigenous life and the immigrants experience, our writers give voice to the darker side of family inheritance. Time After Time. Rowan Hisayo Buchanan joins Jenn Sookfong Lee and Terry Jordan for a conversation about how fiction can open up the conversation about the unexpected trajectories each decision can set in motion and the lingering echo of the road not taken. Buchanan's book examines the conflicts between generations of Japanese immigrants to America. Lee's book looks at the secrets kept between mother and daughter and the gap between privilege and desire. Jordan's book takes readers through the rise and fall of fishing life in Newfoundland. Family Matters. When Stella, a young Métis mother, looks out her window one evening and spots someone in trouble on the Break—a barren field on an isolated strip of land outside her house—she calls the police to alert them to a possible crime. The Break by Katherena Vermett presents a comprehensive story about lives of the residents in Winnipeg’s North End is exposed. David Bergen's Stranger is a stirring tale that lays bare the bonds of motherhood, revealing just how far a mother will go to reclaim her stolen child. Íso, a young Guatemalan, works at a fertility clinic at Ixchel, where she becomes the secret lover of an American doctor, Eric Mann. After the birth of her daughter, the baby is taken from her and sent to America. Determined to reclaim her stolen daughter, Íso makes her way north through Mexico, eventually crossing illegally into a United States divided into military zones. Gently to Nagasaki. Set in Vancouver and Toronto, the outposts of Slocan and Coaldale, the streets of Nagasaki and the high mountains of Shikoku, Japan, Gently to Nagasaki is also an account of a remarkable life. As a child during WWII, Joy Kogawa was interned with her family and thousands of other Japanese Canadians by the Canadian government. Her acclaimed novel Obasan, based on that experience, brought her literary recognition and played a critical role in the movement for redress. In her new book, interweaving the events of her own life with catastrophes like the bombing of Nagasaki and the massacre by the Japanese imperial army at Nanking, she wrestles with essential questions like good and evil, love and hate, rage and forgiveness, determined above all to arrive at her own truths. Kay’s Lucky Coin Variety. Ann Y. K. Choi is a coming-of-age story that portrays the life of a young Korean Canadian girl who will not give up on her dreams or her family. Family secrets, a lost sister, forbidden loves, domestic assaults—Mary discovers as she grows up in the 1980s that life is much more complicated than she had ever imagined. Her secret passion for her English teacher is filled with problems, and with the arrival of a promising Korean suitor, Joon-Ho, events escalate in ways that she could never have imagined, catching the entire family in a web of deceit and violence. Do Not Say We Have Nothing. Nominated for the Man Booker Prize and the Governor General's Award, Madeleine Thien's new novel takes a look at the enduring effect of the Cultural Revolution in China. Set in China before, during and after the Tiananmen Square protests of 1989. Thien takes us inside an extended family in China, showing us the lives of two successive generations–those who lived through Mao’s Cultural Revolution in the mid-twentieth century; and the children of the survivors, who became the students protesting in Tiananmen Square in 1989, in one of the most important political moments of the past century. While genre fiction might seem like a means of escape, other worlds and the people who inhabit them can often teach us more about history, society and ourselves. Through science fiction, fantasy, speculative fiction and re-tellings of history these six acclaimed authors show us how other worlds can help us shape our own. Guy Gavriel Kay's novels have captured the imaginations of readers for decades. His latest novel, Children of the Earth and Sky takes place in a fictional world inspired by the conflicts and dramas inspired by Renaissance Europe. In a world where danger lurks on every side, the story follows the lives of several characters who set sail on the same ship and find their lives and fates entwined. Take a jaunt through the paranormal this month as with New York Times Bestselling author Kelley Armstrong, scientist turned fantasy writer Kristi Charish and Anishnaabe writer Nathan Adler. These three authors blend the real and everyday with the more that haunted feeling you just can seem to shake. In Armstrong’s latest book, Betrayals, Olivia finder herself investigating the murder of street kids to find the truth and clear her friend's (and lover's) name. In T he Voodoo Killings Charish introduces readers to Kincaid Strange, whose partime gig running séances for university students soon turns into the investigation of a string of murders. Drawing on Indigenous storytelling and the windigo, Adler's novel tells the story of a hereditary monstrous disease and secrets buried deep in bones and blood that the Church wants to keep secret. Award winning Canadian author M. G. Vassanji is no stranger to new lands, real or fictional. But his new novel, Nostalgia takes on the dystopian genre in Brave-New-World-esque future set in Toronto. The rich live forever by erasing their memories and implanting new ones. A doctors who is attempting to help others keep their old memories from seeping into their new life suddenly discovers he has his memories of a past life. But what do these memories mean? And what will he learn about himself? 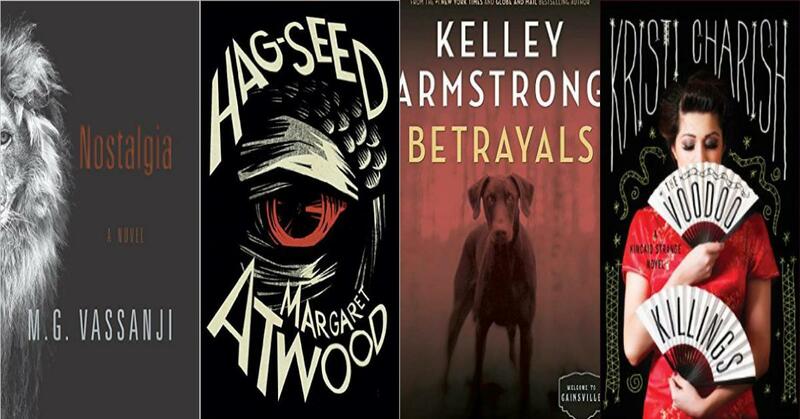 Margaret Atwood is back with a new retelling of Shakespeare's The Tempest in Hag-seed . In her retelling, Felix, an Artistic Director of a theatre festival, plans what should be an unforgettable performance of The Tempest but when he is ousted from his position and sent into exile he lands a job teaching theatre in a prison. Atwood once again takes us into an exploration of the prison system where the prisoners as actors, in a theatrical plan to snare Felix's enemies. It’s magic! But will he succeed? Before the evening’s main event, our own Daniel Bezalel Richardsen stands at the lectern to launch the latest issue of Foment , the Festival’s literary review magazine that is now in its fourth year of being. For Daniel and the other Foment volunteers (myself included) it has been a labour of love, and something we are all extremely proud to be a part of. The man we are all here tonight to see is David Mitchell, who starts with a short reading of a passage from his most recent book, Slade House . In the passage, a young boy named Nathan is visiting the mysterious Slade House with his mother in 1979. He has befriended another young boy called Jonah and together they are playing a game called Fox and Hound. As they play, the garden of the house starts dissolving before Nathan’s eyes, and Jonah transforms from innocent young boy into a snarling beast – but is this real or due to the fact that Nathan is high on Valium? We are left wondering. The evening is hosted by Peter Schneider, a long-time friend of the Festival. Schneider opens the conversation by asking Mitchell about the libretto that he wrote for his Dutch composer friend, Michel van der Aa, for the 3D opera film Sunken Garden. Schneider commented on the similarities between the material for the Sunken Garden and Slade House. Mitchell responded that he hates to waste material, it evolved into a new story within Slade House. He wanted a go at a ‘ghost novella’, the novella being a unique form to conquer this genre, by shortening the typical word count of the average ghost fiction. This is simply Mitchell being Mitchell – subverting the status quo and flipping it on its head. When Schneider commends Mitchell on the fully dimensional characters within his novels, Mitchell balks at the praise, describing the compliment as something akin to likening him to ‘a giant among pygmies’. He believes that to do anything less than provide his readers with fleshed out characters with distinctive voices, would mean that he wasn’t doing his job as an author very well. This modesty further endears you to Mitchell, whose self-deprecating charm has already sucked me in, all the more. Though Slade House is a shorter work than Mitchell’s other novels, it is no less richly imagined. Schneider questions Mitchell about his attention to structure, pattern, and design, which is prevalent in all his works. Mitchell settles in for a lengthy discussion – he loves talking structure and jokes that he could talk about it all night. He states that structure is the author’s chance to be truly innovative – it is the casing for the narrative, which makes the novel better. On the subject of structure, Mitchell mentions Kate Atkinson’s Life After Life as an example of a book he read whose structure he was greatly impressed by. Mitchell lived in Japan for eight years in the 90’s, and Schneider questions him about the impact the country had on him as a writer. It is clear he is influenced by the country, as he wrote his first two books there and he says that his early novelistic role models were all Japanese. His lack of the Japanese language contributed to the discipline of his writing, he described himself as “linguistically infantilized”, saying that having no one to talk to made him more introspective and insular. Mitchell talks about the dichotomy of the country, saying that it’s almost as if there are two Japans – the ancient Japan of wisdom and silence, and the neon, futuristic Japan of today. Despite their differences, they blend together to create a country of immense depth and history. During the hour-and- a-half chat between Schneider and Mitchell, many deep and thought-provoking topics were discussed – the rise of technology and the effect it is having on children today; conformity versus individualism; the bond that story-telling creates between generations of humans; and finally Mitchell’s work towards heightening awareness about autism, and how having an autistic child has made him a more enlightened parent. With every new topic, Mitchell gave all of himself to the conversation, holding nothing back and speaking honestly and openly about his opinions and experiences. I believe this quality of his personality attributes to his astounding success as a writer – his ability to feel deeply and to express himself eloquently and profoundly. It says something about the cynical times in which we live when the phrase “Dinosaurs have really lost their luster” is met not only with laughter, but with nods of agreements from the audience. Gone are the days that these 16 foot tall monsters could inspire awe (and maybe even fear) With movies and other media representing the creatures in every way shape and form, dinosaurs have become a household staple over the past three decades. In his book Every Hidden Thing , author Kenneth Oppel takes the readers back to a time were dinosaurs still had a bit of wonder and mystery hidden within their bones and explorers were fighting over the prestige of being the first to discover these fossils. Oppel spoke about his new book to a crowd of nearly 100 eager listeners, ages ranging from 10 to 60, offering passages from his story and insights into his research with the goal of reigniting some of the splendor that finding multimillion year bones used to raise. Oppel began the night by offering a glimpse into the setting he created for his book. Alone on stage, equipped only with his novel and his PowerPoint, Oppel read a passage from his book to the crowd of eager young adults; an act that, judging by his demeanour and expressive tone of voice, Oppel had plenty of practice doing. Every Hidden Thing takes place in the late 19th century, and follows the tale of two 17 year old amateur paleontologists, pitted against each other by their waring fathers, in a hunt to track down “the black beauty”; a fossil specimen of ebony black bone, larger than any species discovered at the time. The passages Oppel read painted the characters as troublesome and adventurous, yet bright and motivated towards their goals; traits that the young audience could be seen connecting with as they laughed and nodded along to Oppel’s reading. Oppel read his passages and engaged the audience with the enthusiasm and wit you would expect from an award winning author focusing on young adult fiction. He spoke with enthusiasm and expression as he excitedly went over the details of his characters, the adventure they were about to set out on, and the research expeditions he himself took part in to bring his world to life. In order to prepare for Every Hidden Thing, Oppel set off on a dig in Dinosaur National Park, Alberta, with a team from the Drumheller museum to excavate a skeletal specimen they had located. While he was quick to brush off (no pun intended) his own contributions to the dig, he spoke of the experience with the energy and exuberance of someone who themselves had just discovered a giant petrified skeleton in the ground for the first time. The “mundanity” of dinosaurs resurfaced again when he recounted a moment during his expedition where he excitedly pointed out a bone in the dirt that were passing, only to have his travel guide go “oh ya, those are everywhere. We mostly just ignore them”. Still, the energy of the night could not be ignored, and while the young crowds interest for these prehistoric monstrosities may or may not have been re-piqued, their interest in Oppel’s work, both past and present, hung in the air, and the question and answer period focused heavily on his past series and how these books impacted the readers that now filled the room. Ending with a quiz for the audience (complete with t-shirt giveaways), Kenneth Oppel shared a night with his audience (both of the young and regular adult variety) that promoted his new book, as well as celebrated reading and story crafting as whole, finding ways to reignite fires that have grown mundane and dull, and re-finding our interest in the prehistoric which may have found itself hidden. Every Hidden Thing Is now available in bookstores everywhere.